The compact SD870 packs a smooth design and neat performance in to one durable camera. This camera has 8.3 Megapixels of resolution, which is more than enough to take quality pictures. 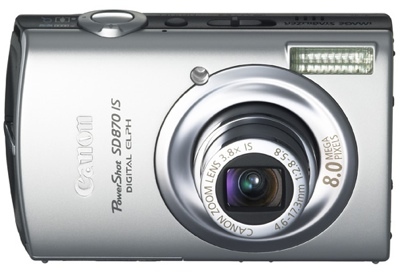 There is also a 3.8x optical zoom, to allow you to get a little closer to your subject. The Autofocus gives you a clearer picture, without having to move a finger. You can alternate the image and video resolutions of the media you shoot with ease. Video will be taken at 30 fps in AVI or Motion JPEG formats. There is no limit to the length of video you take, which means you can use your camera to take video for lengthy events. White balance is adjustable between Auto, Manual, Daylight, Cloudy, Fluorescent and Tungsten. Your taken images will be compressed in Fine, SuperFine or Normal modes. Save your images on either a Multimedia Card, SD Card or SDHC Card. Choose from different flash functions including Flash Off, Auto Flash, Fill-in Flash, Red-eye Reduction Flash or Slow Sync. View your images from the 3 inch LCD Panel, which has a resolution of 230,000 pixels. The Rechargeable Li-Ion Battery will last you for 270 images when fully charged. Cool features include sleep timer, Built-in Microphone, Optical Image Stabilizer, Face Detection Technology and a 90 day warranty. Accessories included with your purchase are Software, USB Cable, Hand Strap, 32 MB Memory Card, Lithium Battery, Battery Charger and AV Cable. From a Gadget Addicts perspective, this very stylish camera belongs mostly in the hands of a beginner. A compact size and a wide angle lens attribute to even swifter picture taking. You are currently browsing the archives for the Digital Photo category.